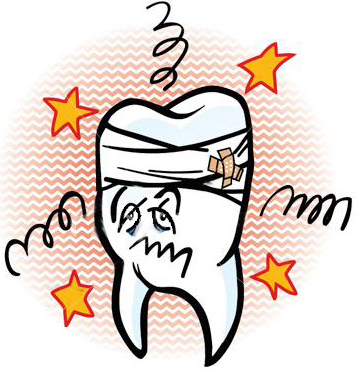 Whatever has happened to cause a tooth to be knocked-out is traumatic enough, but if this happens to someone in your family it’s important to remain calm and follow these steps to increase the likelihood of saving the tooth. Find the tooth and pick it up by its white part (the crown) and not by its root. Rinse the tooth with cold milk or water if it is dirty. Do not rub, scrape, brush or dry the tooth. Do NOT clean it with alcohol or peroxide. Replace the tooth in the socket and press down with your thumb. Have the child bite down on a piece of gauze, a wash cloth or a shirt until you get to the dentist. If you cannot replace the tooth after 5 minutes, store it in a container with Hank’s Balanced Salt Solution (Save-a-Tooth or EMT Tooth Saver), a cup of cold milk, a cup of your child’s saliva or – last resort – a cup of water, until you get to the dentist. Baby teeth (primary) do not need to be replanted. Just apply a gauze to stop the bleeding and visit the dentist for further evaluation. Call the Tooth Fairy as needed!